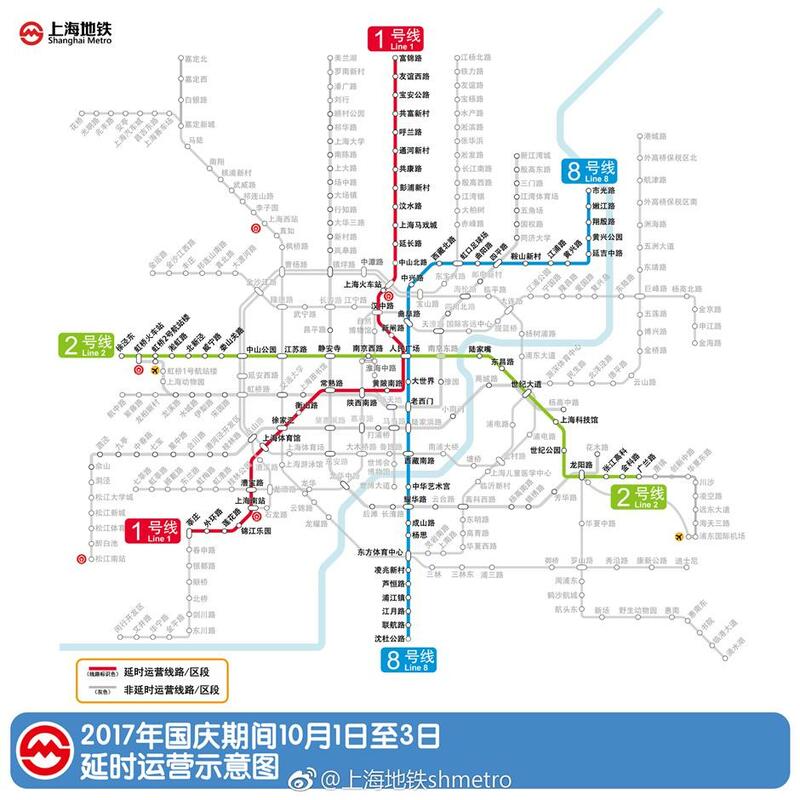 Metro Lines 1, 2 and 8 will extend operating hours from October 1 to 3, and extra night trains will be added on October 7 and 8 to ferry passengers from Pudong Intl. Airport. 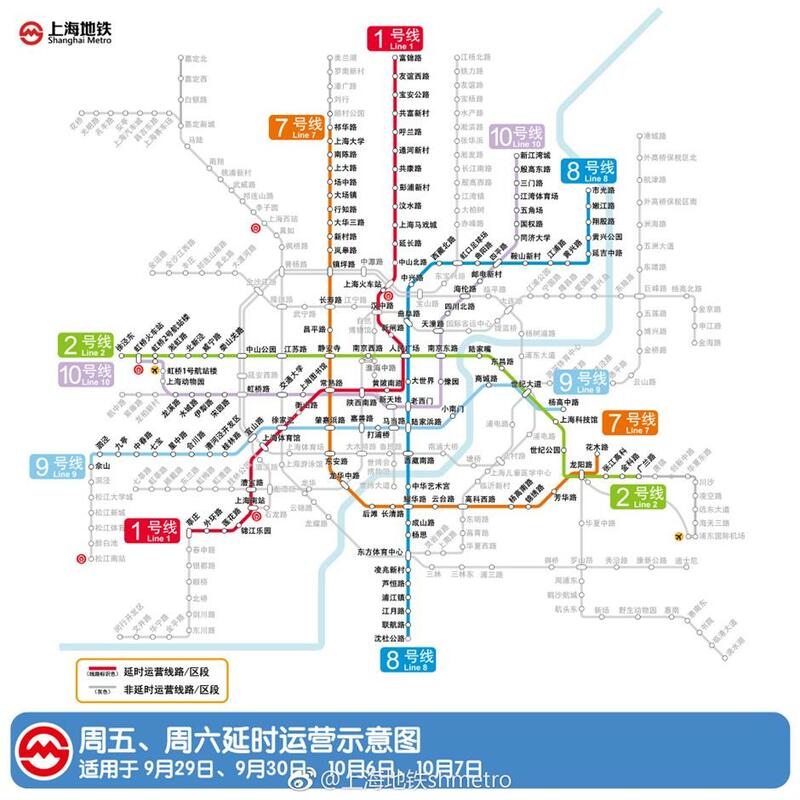 The city’s Metro operator has revealed the operating plans for Shanghai's Metro network during the upcoming holiday. Metro Lines 1, 2 and 8 will extend night operating hours from October 1 to 3. To meet residents’ needs during the holiday, the three lines will introduce the Friday-Saturday schedule with longer operating hours. Metro Line 1 will have service extended by 80 minutes, Metro Line 2 (except for the eastern section) will be extended by 70 minutes, and Metro Line 8 will be extended by 80 minutes. Metro Lines 1, 2, 7, 8, 9, 10 already operate on an extended timetable on Fridays and Saturdays (September 29, 30, and October 6, 7). This extended weekend timetable will continue to apply during the holiday period, meaning that weekend termination hours for these lines will still be 70 to 80 minutes later than their regular timetable. 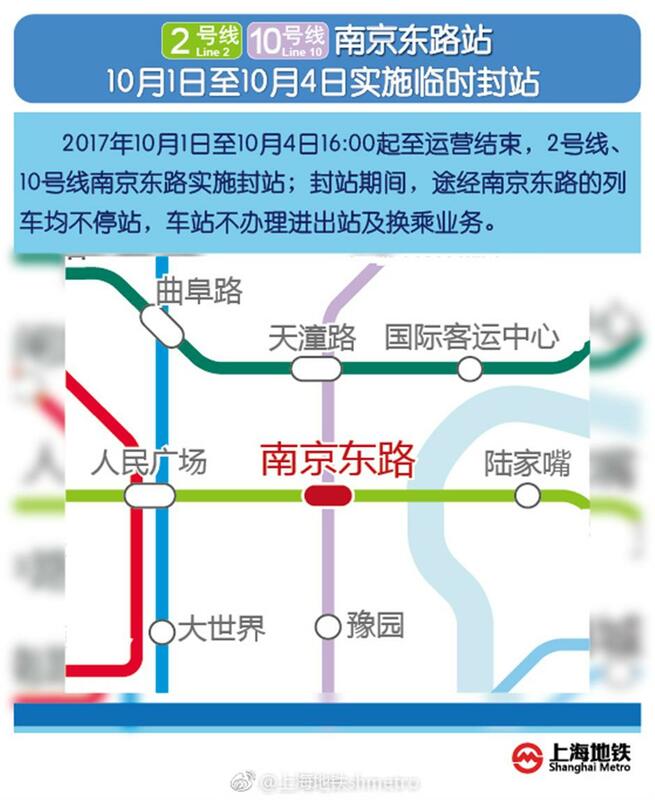 East Nanjing Road station on Metro Lines 2 and 10 will be closed from 4pm on October 1 through October 4. Trains on the two lines will not stop at the station during that period. Nearby stations including People’s Square and Lujiazui will introduce traffic control measures, given the situation, to ensure safety. Extra train services will be added to depart from Pudong International Station in the last two days of the holiday (October 7 and 8) to take passengers back to the city in time. On October 7, the Metro operator will add three Metro services on the eastern section of Metro Line 2. 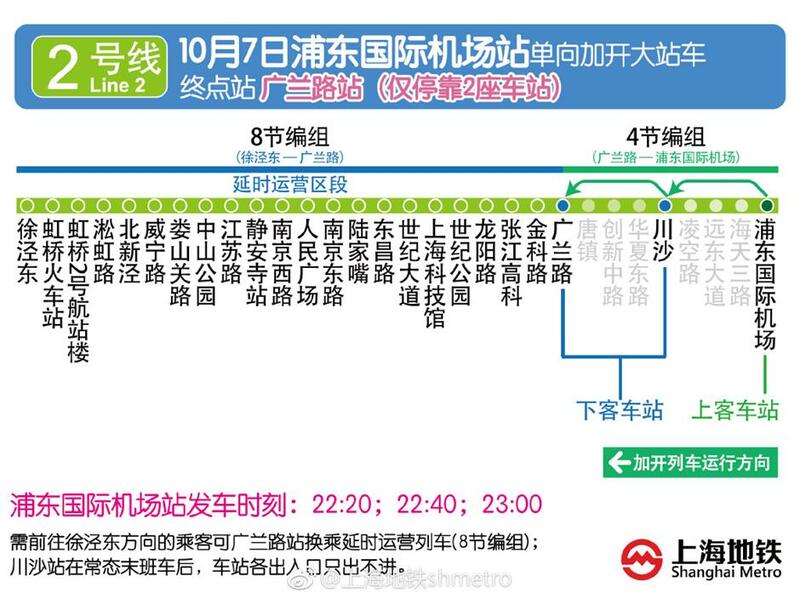 The added service will depart from the airport at 10:20pm, 10:40pm and 11pm, and will only stop at Chuanshan and Guanglan Road stations. Passengers can transfer at Guanglan Road station to the rest of Line 2, which will apply an extended time schedule on Saturday. 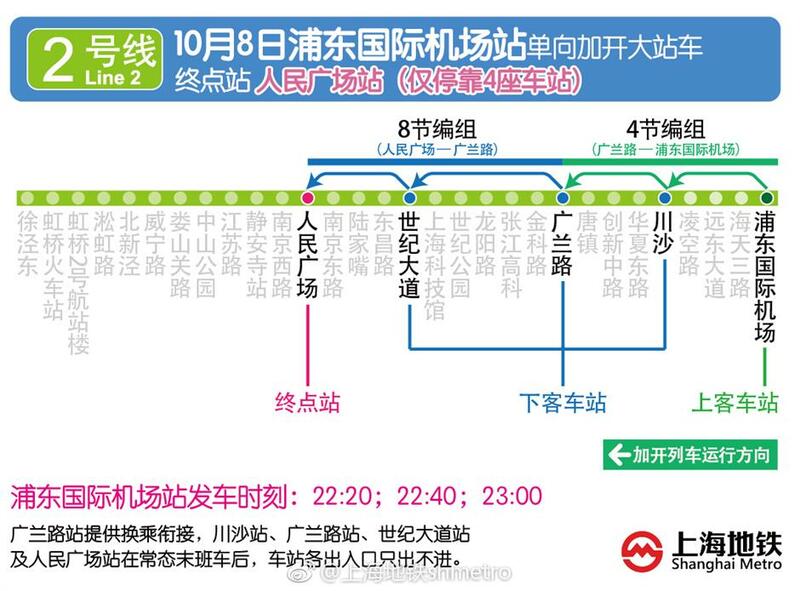 However on October 8, as the rest of Line 2 will use its regular times table, the added three train services will depart from the airport at the same time as on October 7, but only stop at Chuansha, Guanglan Road, Century Avenue and People’s Square stations. The Metro operator will also add staffers and volunteers in major transportation hubs and stations near shopping malls or tourist spots.